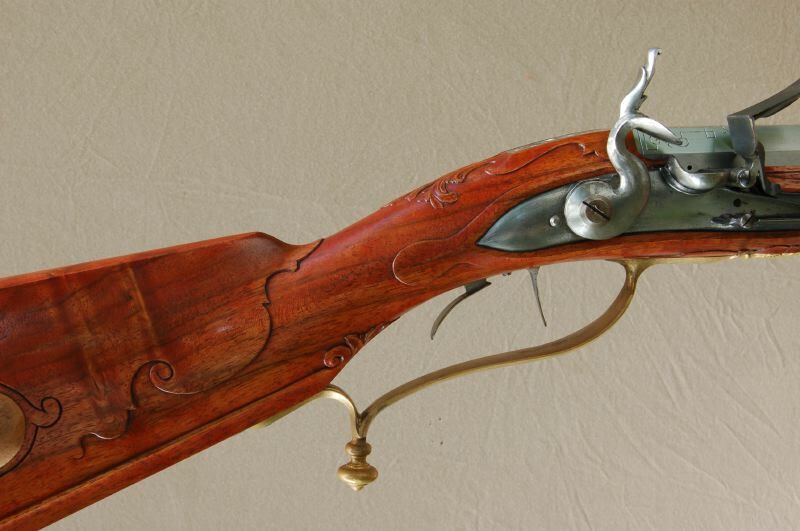 This is a picture of the gun barrel with the tang screwed into the barrel. The tang is a plug, essentially, that resists the pressures of the gunpowder igniting. Since the explosion cannot come out of the plugged end of the barrel, it must go out the other end, pushing the rifle ball ahead of it. The tang also serves as a point of attachment for the barrel. Note the countersunk screw hole… a screw goes through the hole, through the stock, and into the trigger plate on the underside of the stock. The barrel of this gun started as a plain swamped barrel. Swamped is a term for a barrel that is thick at the breech, then tapers thin in the middle, and flares out again at the muzzle. 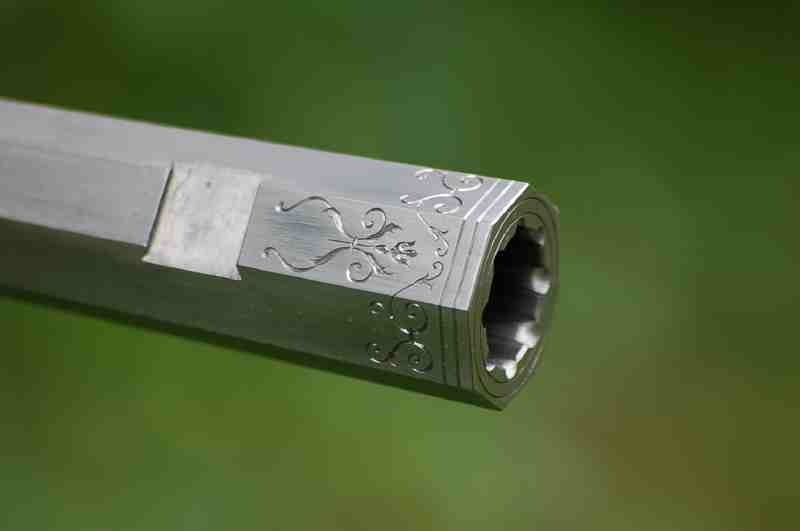 The engraved lines will be filled with silver and gold wires, and then polished flush with the barrel. The barrel will then be fire blued, which will make the gold and silver glory in a rich blue background. Here is the muzzle of the rifle. The engraved design will be filled with gold wire, and some of the leaves and flowers will have line engraving to accent their shapes. The riflings, or grooves, in the bore, have been filed out to make the rifling look really deep. A preliminary sketch in magic marker helps me conceptualize the design. Gold in green, and silver in black marker. Next is the breech section of the rifle barrel. This, too, has engraving that will be filled with silver and gold wire. When the barrel has been completely inlaid with the precious metals, polished and finish engraved, I will then fire blue it. The steel will turn a deep blue and the silver and gold will remain bright. It should be stunning. 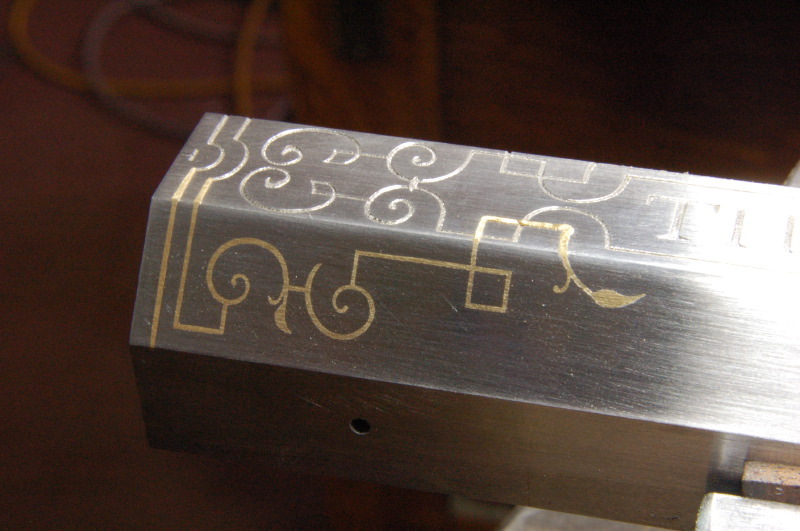 Now I am starting to inlay the gold into the barrel decorative engraving. Each engraved line will have gold wire beaten into it. 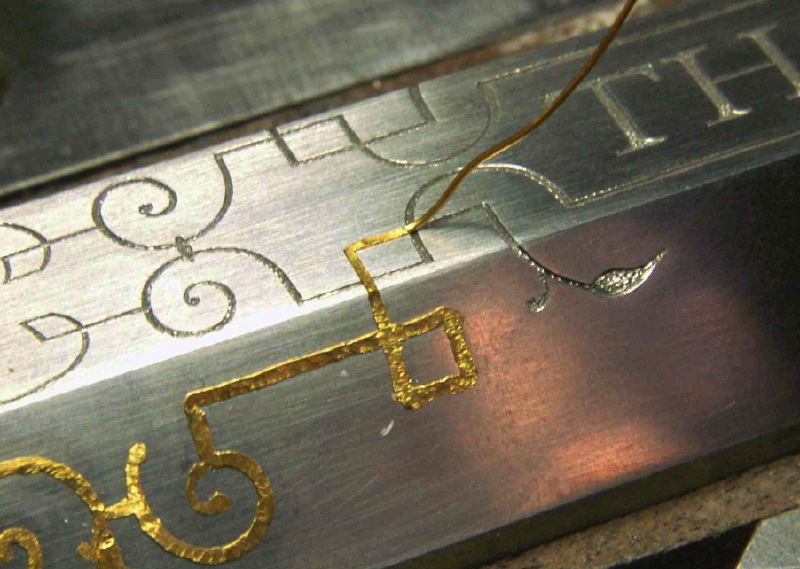 For the wire to stay in place, there must be burrs and undercuts down inside the engraving. I am using 24 carat gold, which is so very soft, it acts like putty, filling every little line and recess in the engraving. The view below shows the wire in the process of being hammered into the grooves. 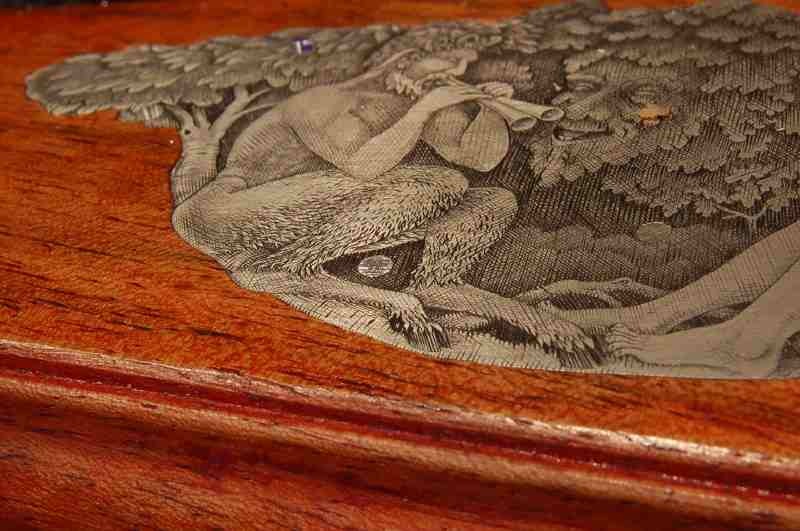 Note, too, that there are little reflections down in the engraving. Those are the undercuts, formed with a punch. In the large areas there are little hooks, raised with a graver, which will bite into the gold when it’s pounded into the cavity. Click on the picture for a larger view. The gold then must be filed off flush with the surface of the barrel, and polished. This really changes the appearance from ‘blobby’ to a finished smooth look. The quality of line shows up at this stage. If I was not aware of my line quality earlier, I’d be noticing it now. The top flat of the barrel still needs to be filled. The problem: how do I hold this inlay in the stock? 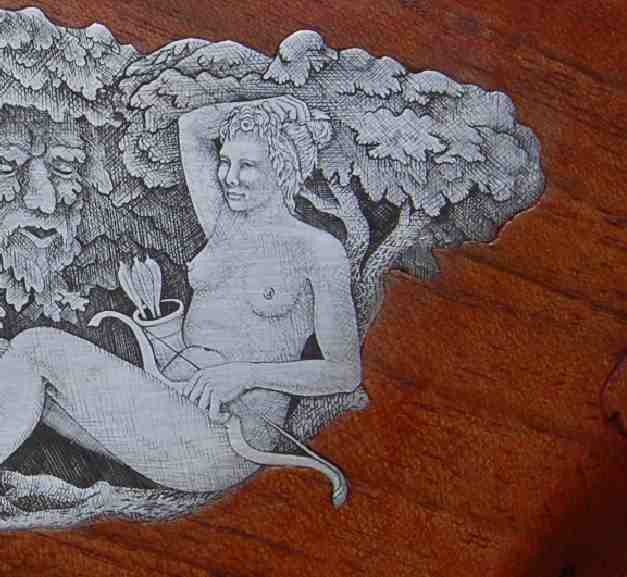 This inlay took over one hundred hours to engrave. I do not want to mess it up when installing it in the stock. I can’t afford to scratch or dent it. After considering a few approaches, I decided that nails would hold this inlay in place. Screws would be too difficult, and an adhesive would not be durable. After looking at many original works, and seeing the troubles with regular nails working their way out of the stock, I knew that a nail with more grip was needed. A ring shank nail would be almost as good as a screw, would it not? But where do you buy them, in silver, no less? Outlined below are some basic steps I took to make my own nails. I want to talk about the ringed shank nail, made of wire, formed with tools you make yourself. The nail head is conical, so it can be filed down flush with the inlay, and filed quite heavily without losing its grip on the inlay. Noteworthy is that the nail heads and countersunk holes in the inlay match perfectly, so the nails become invisible when engraved over. 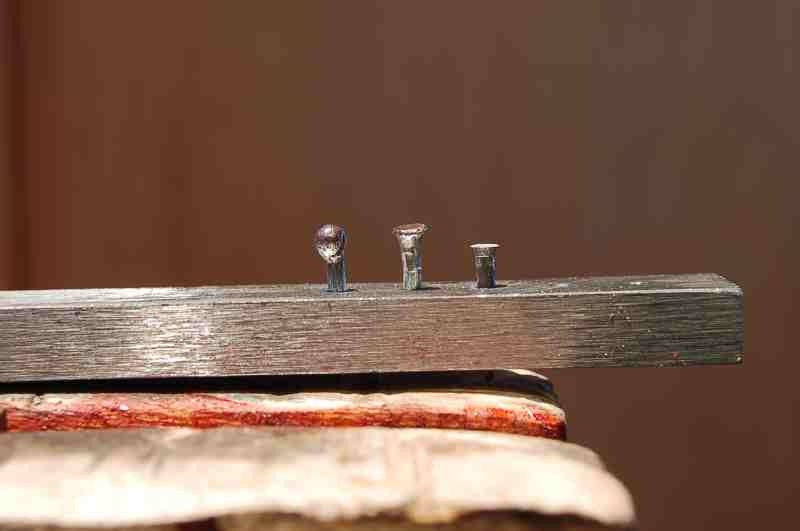 In the center of the photo is a nail on the ring forming plate. 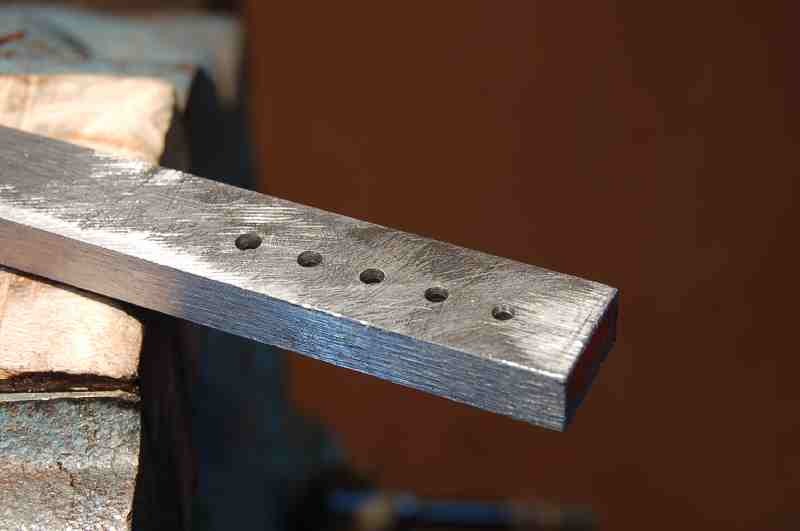 The steel bar with the holes is the head forming plate. To the right is the carbide burr I used to make the countersinks both in the head forming plate AND in the inlay itself, so the head of the nail matches the countersink of the inlay hole. 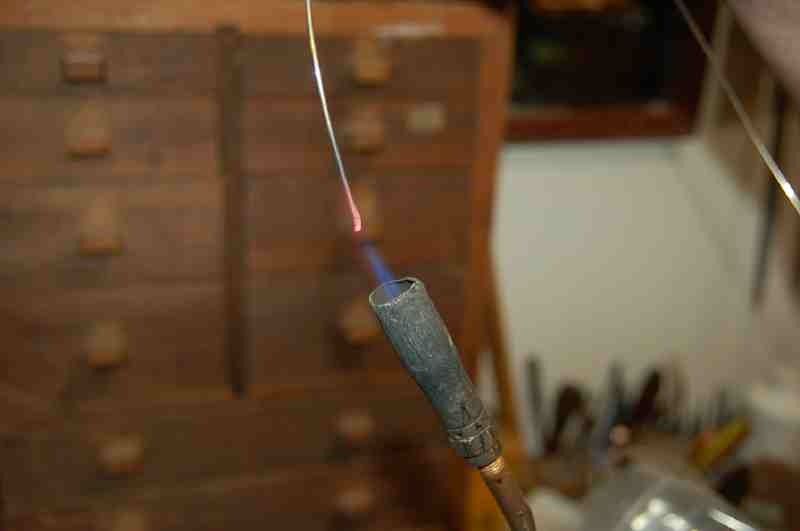 In this shot, I am heating the silver wire with a torch to form a blob. That blob will be used to form the head of the nail. When the tip of the wire melts, it forms a little ball on the end of the wire. Nip wire off to the length you need. I used 3/8″ length for this inlay. Three wires in the fixture just to show the sequence, from left to right. On the left is the blobbed wire. middle wire has been pounded into the fixture plate. The right hand wire has been pounded in and then filed flat. The forming plate has a series of holes, each hole ever so slightly bigger than the next in head diameter, about .005 increments. The through holes are .062″diameter for .06″ wire. 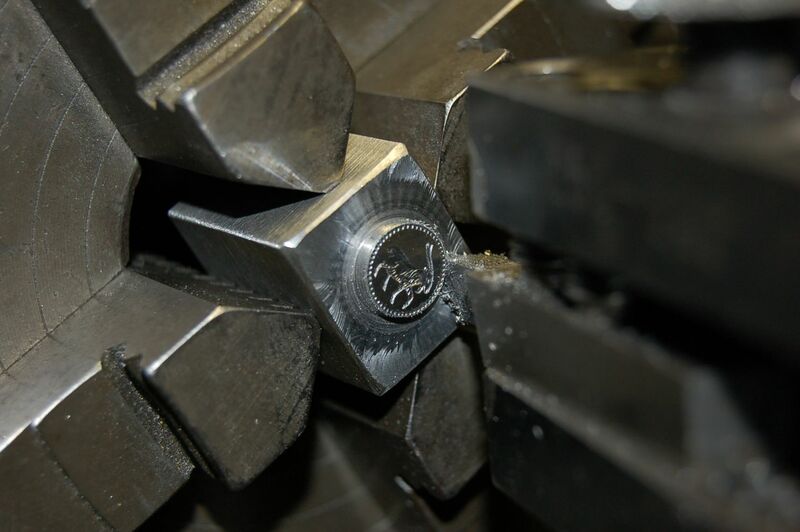 The nail, with its head already formed, is placed between the two dies, and rolled with some downward pressure, back and forth, until the grooves are formed. The dies are cut from an old mill file with a chop saw. The teeth have a backward set, so make sure you get the barbs going the right way on the nail shank. I did a test where I drove a nail into some scrap walnut, and tried to pull it out. The head came off instead of the nail pulling out. A nail is partially inserted into the hole. Note the other hole to the right in the background, countersunk to match the nailhead. I predrilled the hole in the wood. The hole size is determined by testing on some scrap of the same wood. 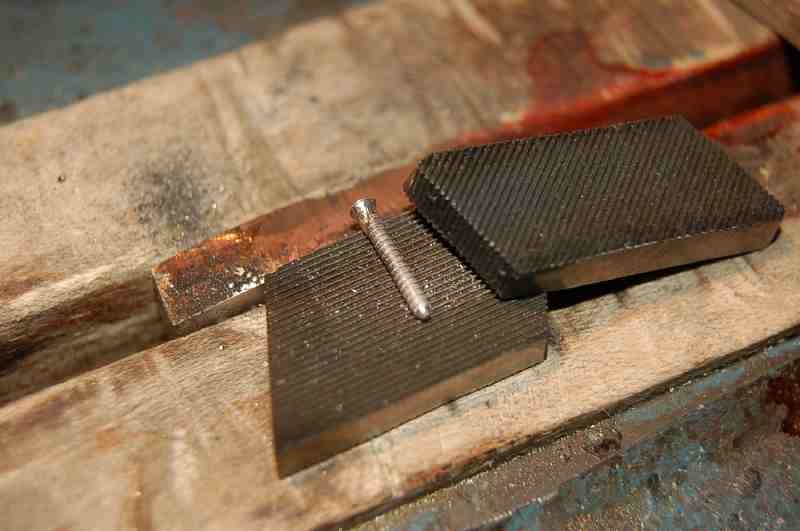 This picture shows some nails set fully, ready to be engraved to match the inlay’s existing engraving. 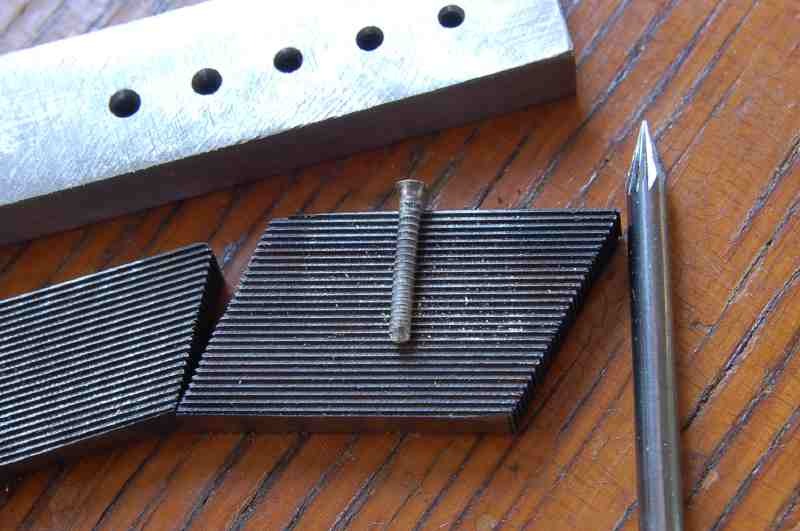 The nails are about .005″ above the inlay’s surface. I did not want to have a lot of nail head to remove, as my chances of messing up the original engraving would be much higher. 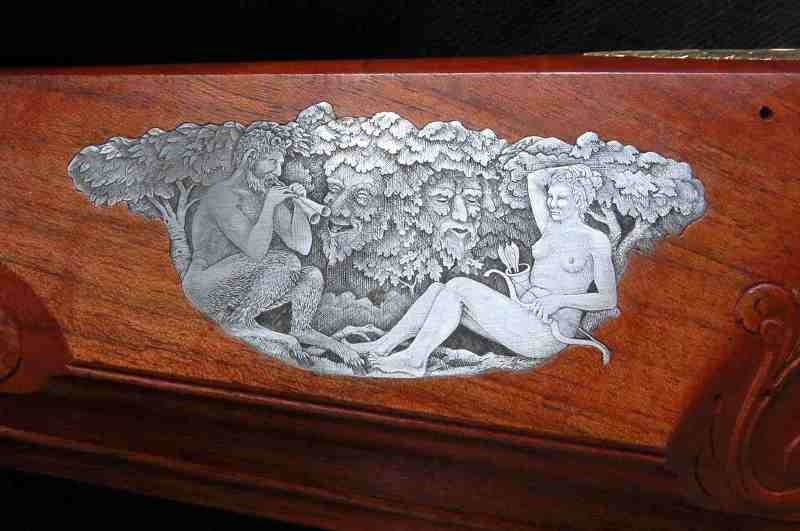 one under the satyr, and one halfway between his knee and Diana. 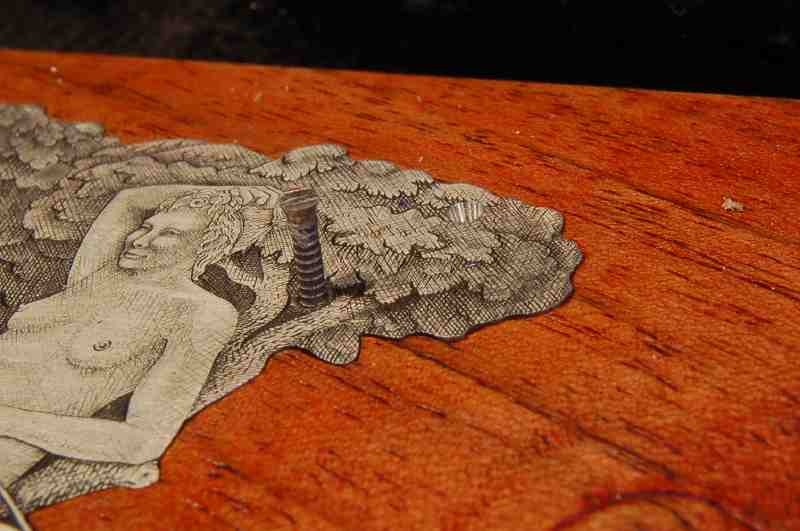 For inlays that will be engraved AFTER nailing, just leave the heads proud, and file them flush right in place. Engrave right over them. They are not going to move. Below you can see nine or ten nail heads, proud of the surface of the inlay. 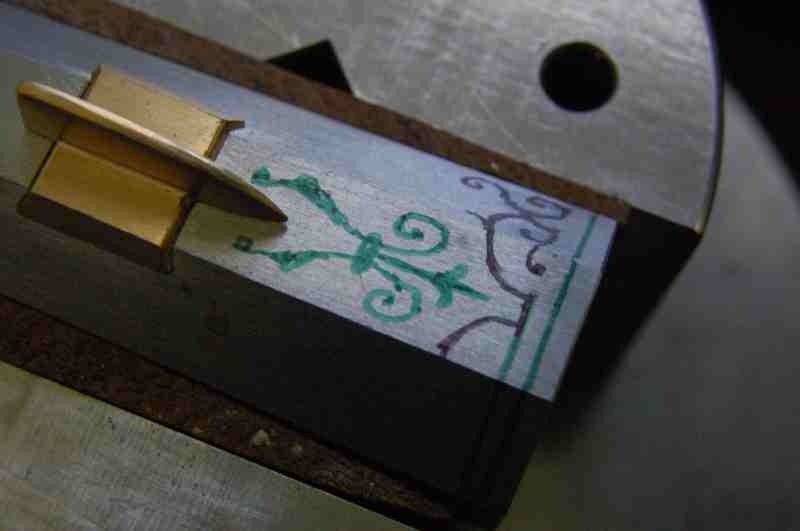 I will take a graver, and cut them very carefully, to avoid scratching the delicate engraving of the inlay. In the picture below, the nails have been very carefully cut flush, and then engraved to match the original engraving as closely as possible. There are four nails in this shot; you may be able to find them, refer to the photo just above this one for their locations. I am posting these pictures, even though much of this work has been done for a while. It’s mostly for me to look at the while project, step back, and take inventory of what’s done, and what still needs doing. I often don’t really look at my own work critically until I’ve posted the pictures. Why that is, I don’t know, but putting my work on the web helps me to look at my work with new eyes. So far, I’ve posted only detail shots, and I thought it was about time to post a full length shot. I must take note that I still need to make a ramrod. This is a view of the lock area and the wrist carving. Click on it for a bigger view. The tang will be casehardened and polished up bright, and the barrel will be blued. That goes on my ‘to do’ list. The lock, as you may notice, is still unfinished, top jaw and screw need to be installed. 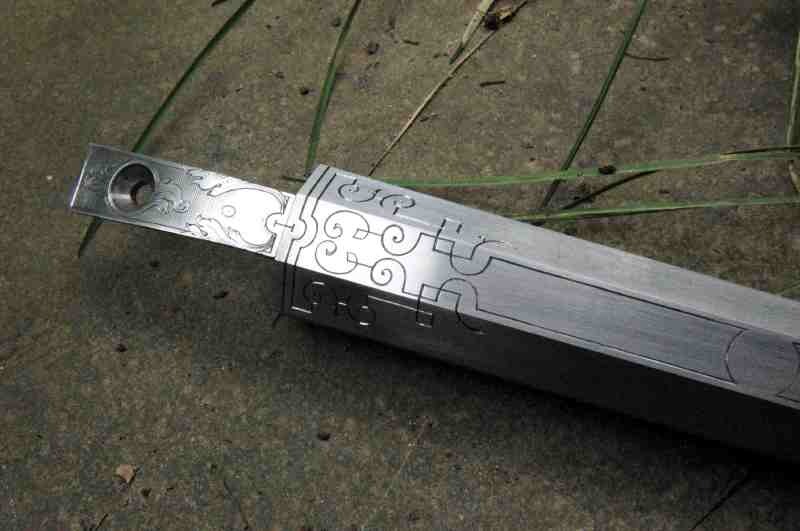 The lockplate itself needs to be polished and engraved, design yet to be determined. I don’t work from plans, but I use a lot of reference material, then make a composite of original work and my own ideas. 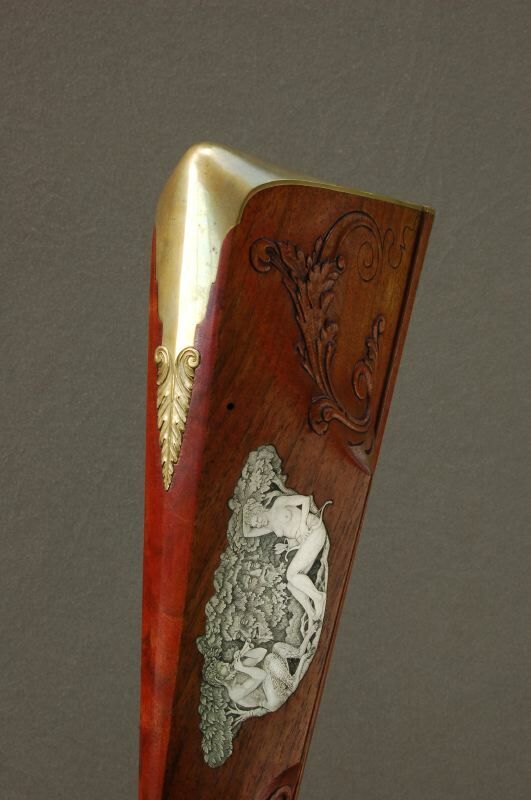 Note the ‘cameo’ carving around the wrist, where the wrist, or grip, seems to slip under the buttstock. That’s fun stuff. 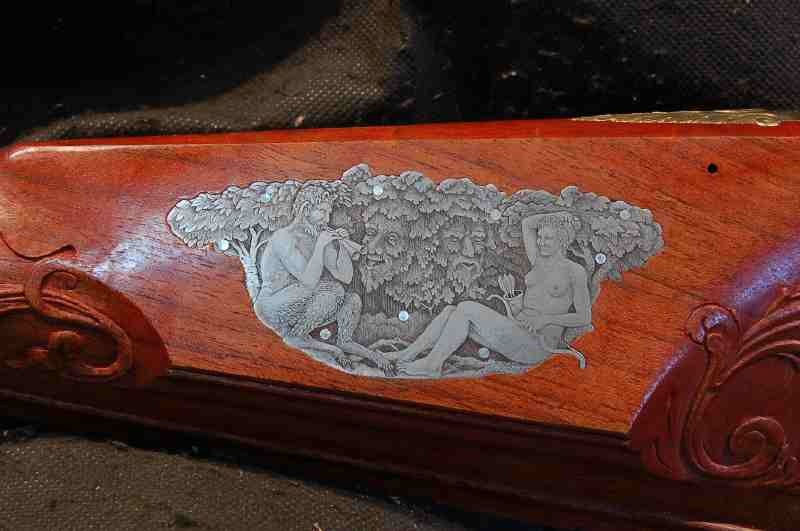 Here is a view of the ‘behind the cheekpiece’ carving. This is one of my favorite areas on a gun. It’s almost like guns were invented to have a little spot like this to carve. This design is based on an American gun, but taken back fifty years to Germany.You can also get a hint of the toeplate under the lower edge of the stock. 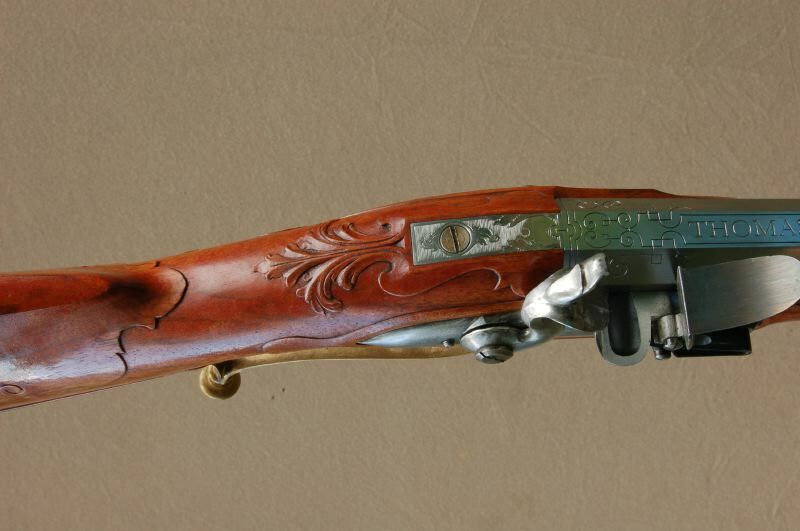 Ahh, this is another view of the breech and tang area, with the barrel engraving showing. 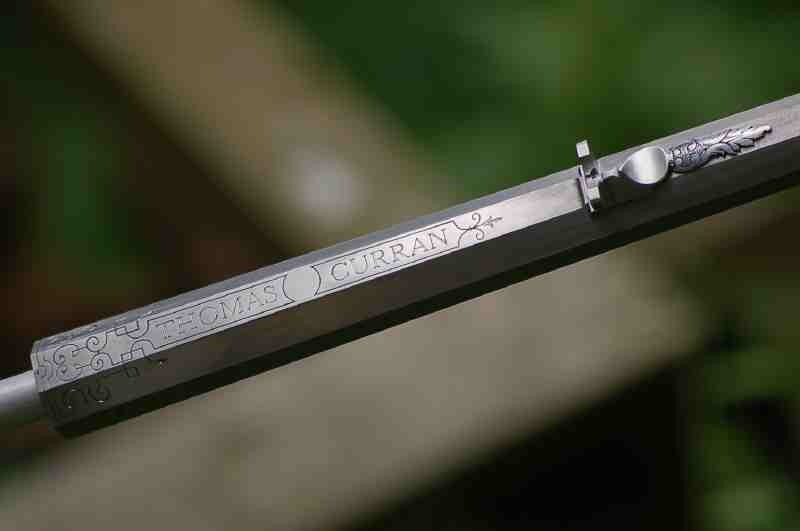 This engraving is to be filled with gold and silver wire, then the barrel will be blued. Add that to the list, please. A view of the buttplate and its extension. 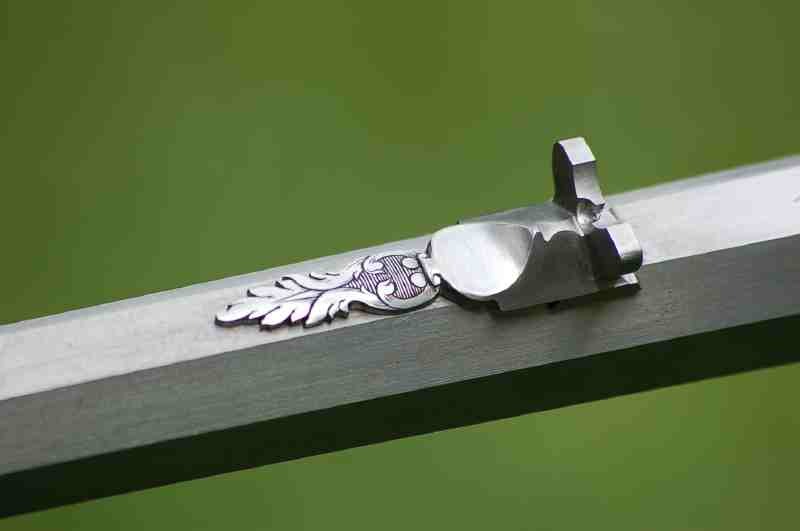 All up and around the heel of the buttplate will be engraved in the baroque manner, as best I understand it, anyway. I have been studying the Baroque and Rococo art and architecture for years, and I feel like I am just starting to scratch the surface. 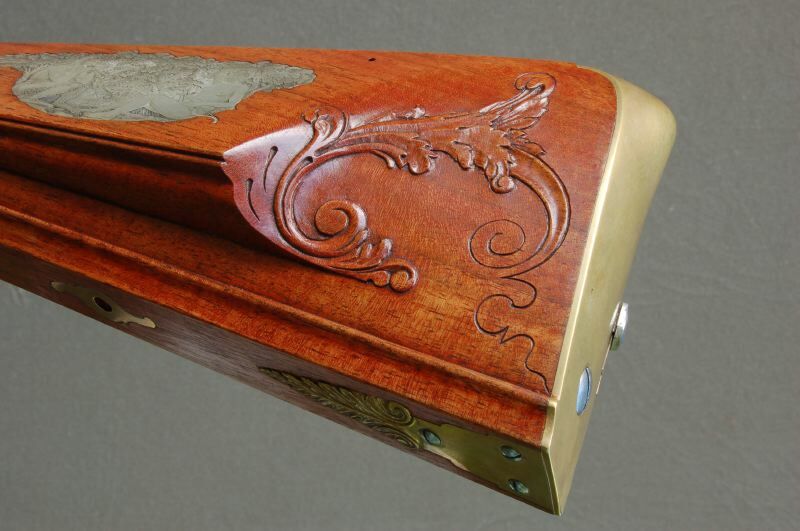 The cheekpiece inlay shows rather well in this shot. Yummy. 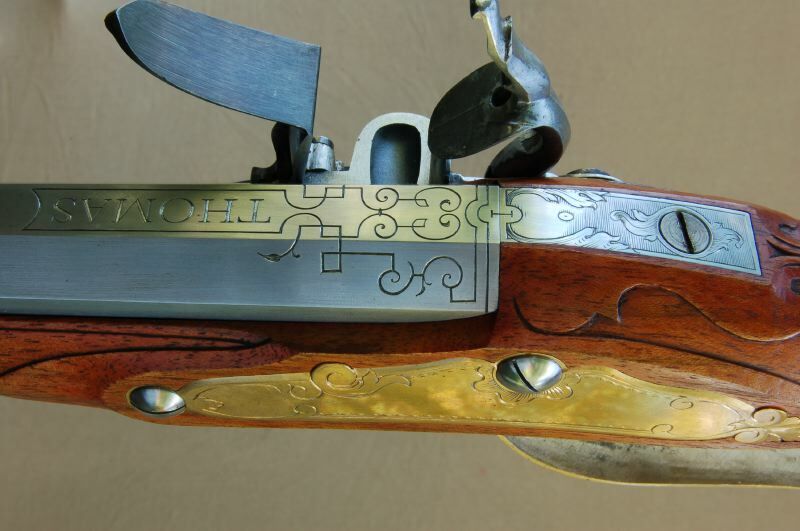 Many of the Jaeger rifles I have seen have an intaglio stamping of some sort in the barrel. Often these are maker’s marks or the mark of the master smith. The images can be letters, or symbols, or sometimes tool, like shears, or hammer and anvil. Sometimes there is a single large stamp, or the stamps can be smaller, and can be found in multiples of threes or fours. 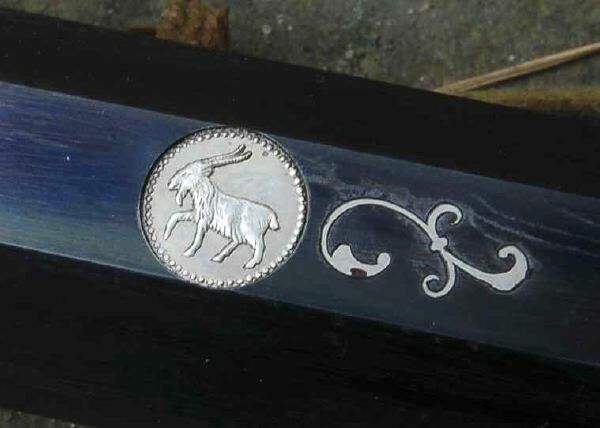 I chose this goat, because I liked him, and he is distantly related to the Satyr or faun on the cheekpiece inlay of my current rifle. 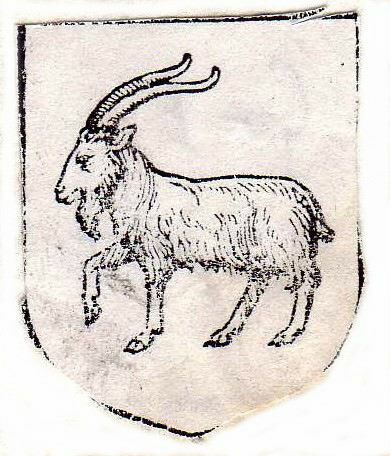 This fellow may be from a heraldic crest or illustration of a children’s book. What I am doing here, is making a positive model, which I will use to form a negative image. I chose to work in the positive, because it is much easier than cutting a negative cavity of the goat. 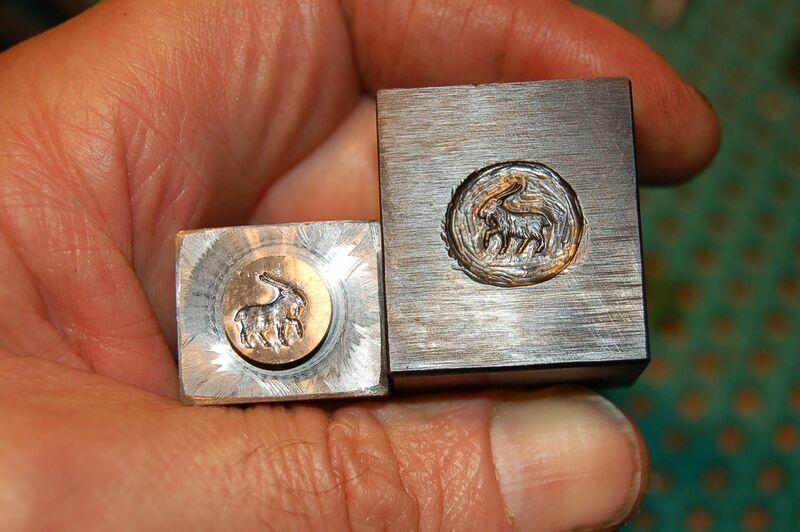 When this master is complete, and hardened, it will be pressed into soft steel to make the actual stamp. In other words, this master is merely a tool to make another tool. Here is a piece of 0-1 tool steel, with the goat roughed out. 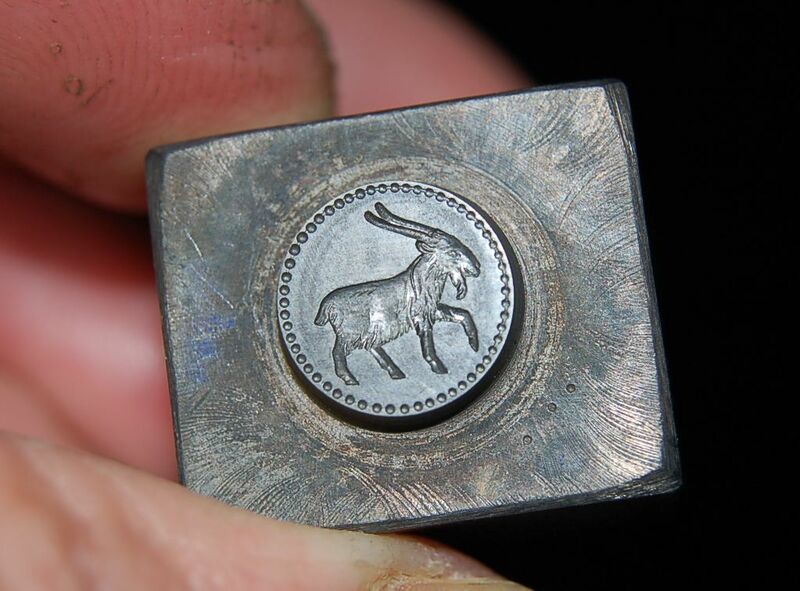 Really gouged out with a round nosed tool, and the goat is outlined with a vee tool. The goat is 5/16 of an inch long, from nose to tail. Maybe the deepest cuts are 1/64″. This will be forming gold later on, and the deeper it is, the more gold I will need to use. The raised area is then modeled with various tools, chisels, scrapers and burnishers, to get a fully developed form. 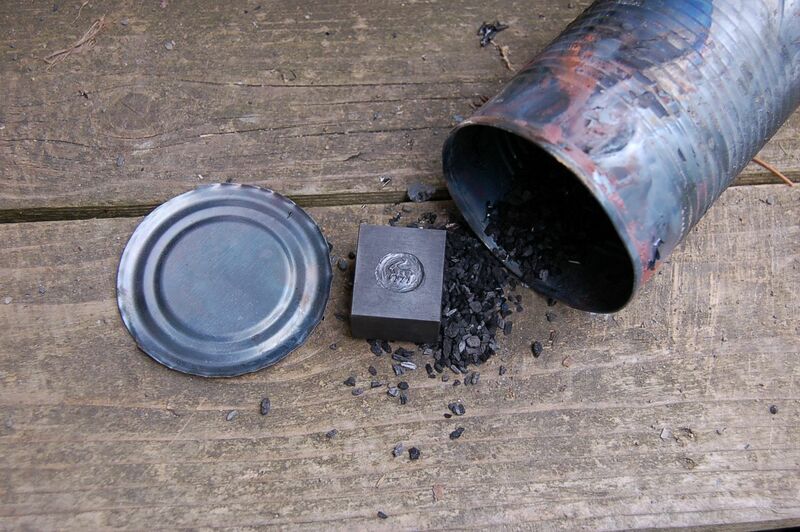 The finished engraved master is placed in a tin can, packed with charcoal. 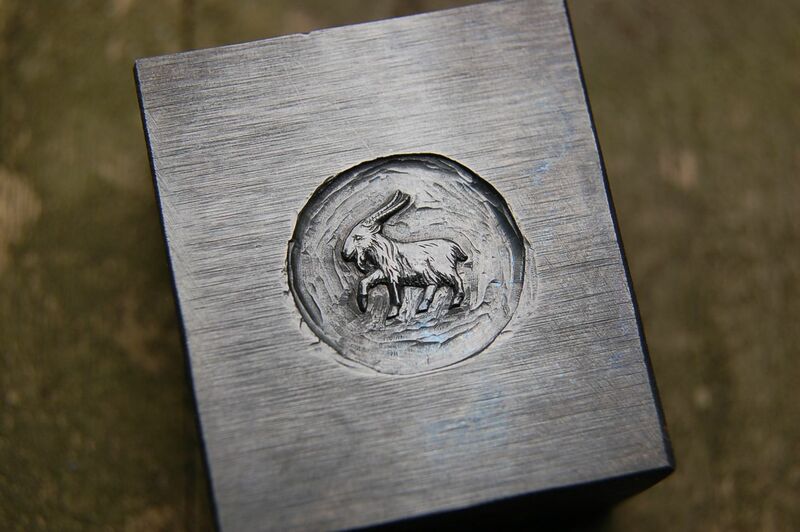 The charcoal prevents scale from building up on the surface of the stamp. 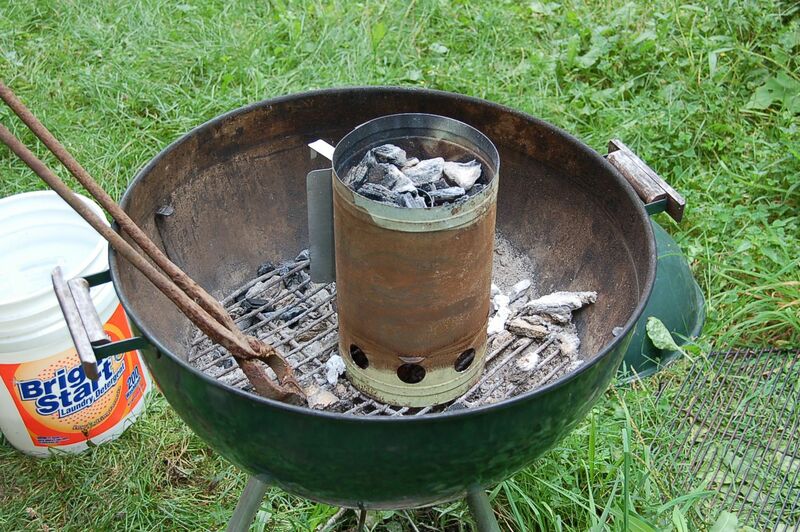 Then the can is placed in a deep charcoal fire. I like the can to be orange hot for a full half hour. I then dump the contents of the can into hot water. This steel, 0-1, is actually oil hardening, but I use hot water. More environmentally friendly. Oh, and there is a screen at the bottom of the plastic pail, to keep the hot chunk of steel from melting through the bottom. Now here is the hardened image. I quenched it in the hot water, and then brought it back up to 400 degrees for a half an hour. This makes the steel less likely to crack or chip. 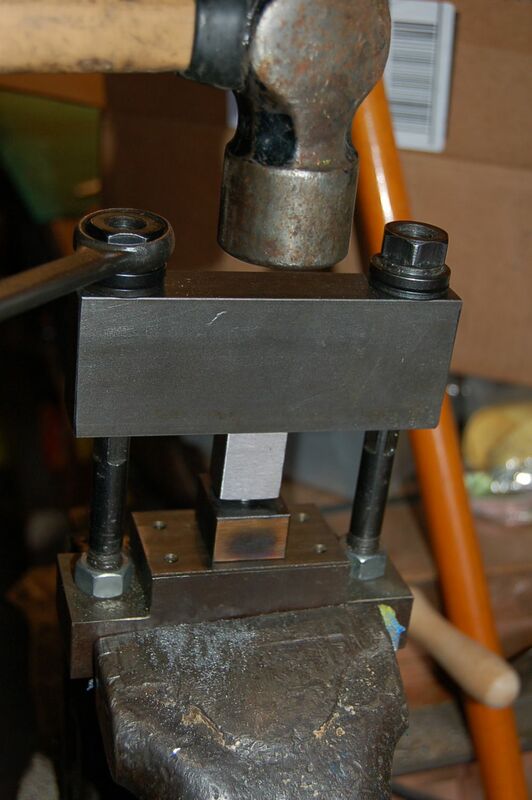 Now that I have my goat master formed in hardened steel, I can press that ‘goat’ into soft steel. 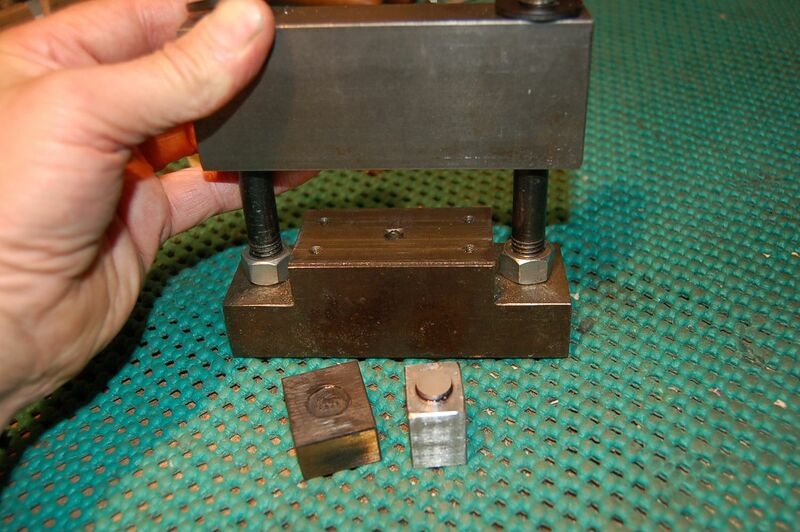 I prepared a blank stamp out of soft 0-1 steel, with the stamp area raised above the body of the stamp. 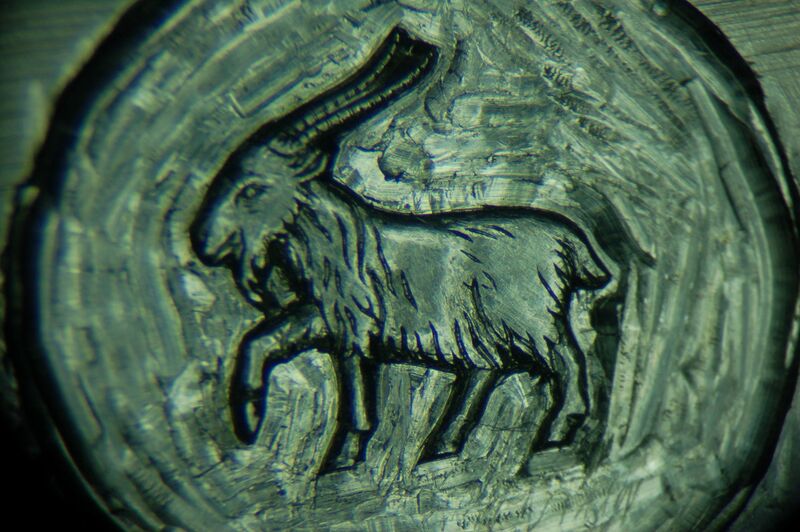 On the right foreground is the blank stamp, and to its left is the hardened goat master. Behind these two pieces is the press. Now I have the two pieces in proper alignment, and clamped up in the press. The threaded rods are used merely to clamp the parts, and to keep the two halves of the press level as I pound on the top jaw. I should say, it’s more of a heavy tapping. At every blow, I tighten the nuts. It’s the hammer that does the work. The nuts just keep the work from shifting. I measure the spacing on each end of the press every so often to make sure it’s staying parallel. 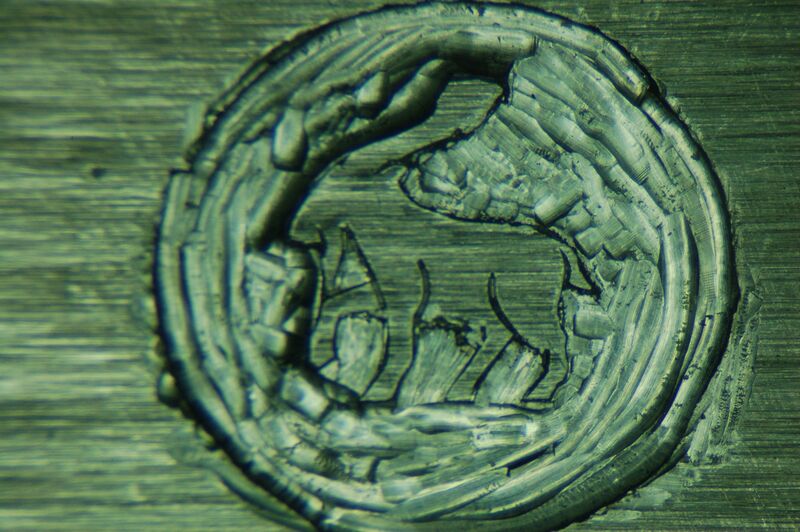 Here is the stamp, chucked up in the lathe, to turn off the excess material, and to center the image. Note the little border of dots that I punched in by hand. Up to this point, the steel has been malleable and machinable. Now I harden it in the charcoal fire. The stamp is now ready for use. 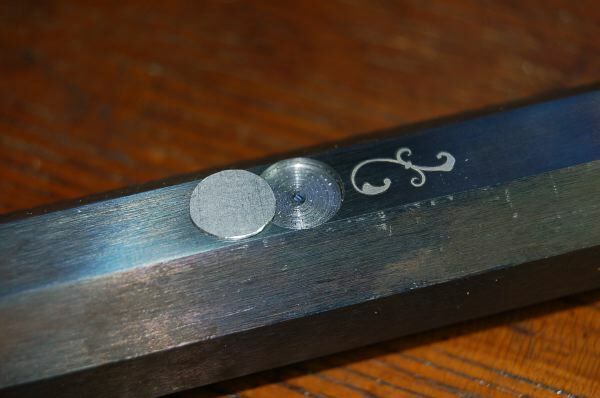 Now that the stamp is hardened, I want to proof it in silver, to make sure it will work for the barrel stamping I cut a piece of fine silver, anneal it completely, and position it on the stamp. 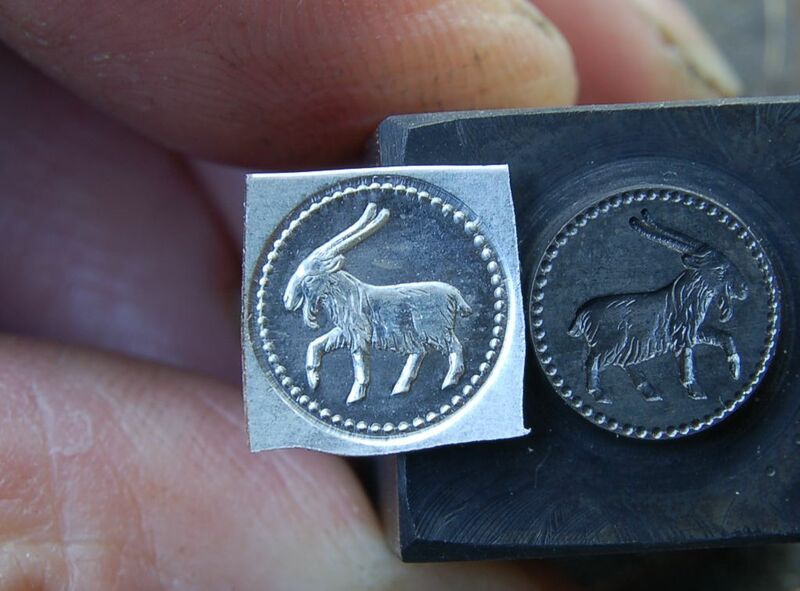 I place the stamp and the silver carefully in the press, the same press shown earlier. Carefully I tap the top of the press and tighten as I go. I take a guess about how much pressure, how much tapping…..until I feel it’s about right….and I open the press, holding my breath………….. I thought I’d better learn how to do this before I set to work on my REAL gun barrel. This is just a scrap piece of barrel for trying out techniques on, so no harm done if I mess up. There is a disk of silver, that drops into the pocket I prepared in the barrel. The pocket itself has an undercut all the way around the perimeter for the silver to smoodge into. With a graver I raised a bunch of little barbs on the floor of the pocket to grip the silver once it gets pressed in. Note that the disk is a little sloppy in fit, not quite round, but that it does not matter. The silver will squeeze out under the die to close up any gaps. Here it is, all pressed in and the barrel has been re-heated to turn the steel blue. This kind of blue is not very permanent, but it was commonly used in the 18th Century.